Limerick County Council has issued a public drinking water notice advising Newcastle West residents to boil their water before use. The areas affected by the boil notice include Newcastle West, Coolcappagh and Rathcahill, as well as the Ballyine, Dually, Reens Kilscannell, Old Mill Road, Killoughteen and Killeline Group Water Supply Schemes. The notice advises that water for drinking purposes, brushing teeth and food preparation should be boiled, and warns that water from the hot tap or domestic filters is not safe to drink. Parts of Limerick and Cork continue to experience flooding and power cuts following the heavy overnight rains. The River Blackwater in Cork has burst its banks and severe flooding is being experienced between Banteer and Mallow. Cork County Council had issued a flood warning for Mallow earlier this morning and council staff distributed sandbags to households and business people. Bridge Street in Mallow has reopened to motorists following but the Town Park Road is still closed until further notice and traffic diversions remain in place. Flood relief works have been ongoing in Mallow for the last six months and are not projected to finish for another 18 months. Further downstream, precautions are being taken in Fermoy where floodwaters are expected to reach the town around 10pm tonight. In Limerick, the ESB says it will take several hours before electricity is restored to 3,000 homes in Newcastle West. 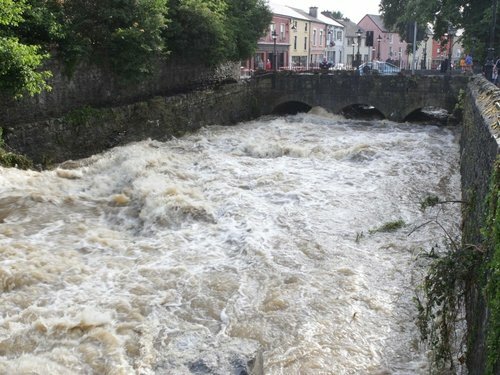 A spokesperson said power had been restored to two generators in the town where a major clear-up operation is continuing after the River Arra burst its banks early this morning. Up to 20 homes were badly affected by flash flooding overnight, described as a 'freak' occurrence. A number of people had to be rescued from their houses after the river in town burst it banks following heavy rain. There were few injuries, however an elderly woman is recovering in hospital after she was airlifted from her home suffering from hypothermia. The Killarney Road (N21) has reopened through Newcastle West, but the R522 to Drumcolliher and the Bruff Line remain closed.